Nearly 35 million U.S. children have been affected by Adverse Childhood Experiences (ACEs). For some of these children, the only place they feel safe is in school. When examining the need for safe spaces in schools, we can call upon Maslow’s Hierarchy of Needs, which outlines five human needs: physiological needs, safety, love and belonging, esteem, and self-actualization. When we reach self-actualization, we are reaching our greatest potential. In order to reach this level in the hierarchy, our basic needs must be met first. So, what does this translate to for our students. Our students must feel safe and supported in order to reach their greatest potential. In order to fit the diverse needs of our students, we must ensure that classrooms are safe spaces where every student feels engaged, empowered, respected, and ready to learn. How can we build these safe and supportive learning environments within our classrooms? Research shows that when teachers form positive bonds with students, classrooms become supportive spaces in which students can engage in academically and socially productive ways (Hamre & Pianta, 2001). Building relationships with our students creates a school culture that is inclusive, fosters personal and academic growth, and encourages positive social behavior within the classroom. One way we can start forming these bonds is by doing frequent check-ins. Try fitting in a quick check-in while heading to lunch or recess, or in other transitions. Creativity is one of the most vulnerable forms of self-expression and it gives us the time to fully commit ourselves to what we’re feeling. By being creative, we’re putting a piece of ourselves out into the world. We’re free to reflect and express ourselves in a way that works solely for us. Carve out time daily for students to express their feelings. Let students choose a medium they feel inspired by; such as journaling, drawing their feelings and emotions, and writing short stories and poems. Studies show that our environment affects how we interact with others, our stress, and motivation levels. Allow your students to choose where they want to sit and create spaces that will spark joy. If possible, incorporate flexible seating, such as bean bag chairs, cushions, or even the floor. One of my favorite spaces to work in our office is on an exercise ball. Allow your students time for quiet, individual reflection. By building their ability to manage a variety of emotions, they will be better able to cope regardless of the situation, setting or people involved. However, as students are in the process of developing these skills, it can be helpful to have a designated space for reflection within the classroom. This can be a quiet space that students can visit when they feel escalated to take a moment to pause and reset. In a diverse world where the needs of no child are the same, it is important that we create spaces where children can acquire the support and the skills needed to thrive. 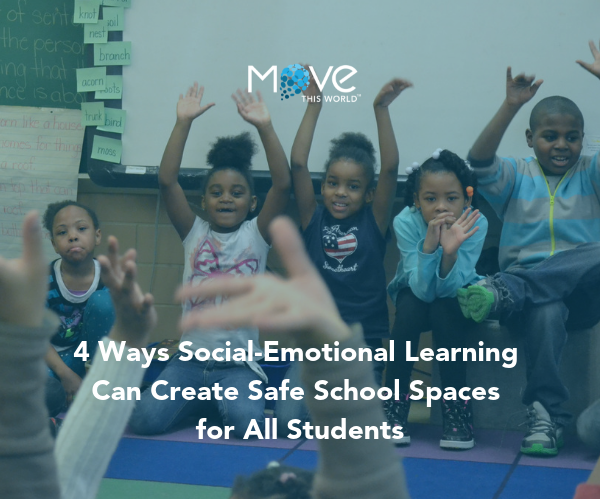 Creating these safe spaces for students doesn’t have to be difficult or time-consuming to have a great impact. This article was originally published by EdWeek Market Brief on March 14th, 2019.